Born/raised in Florida, Captain Thomas C. Talton joined Delta Air Lines 07-25-1960 and was based MIA & ATL. Captain Talton retired 02-01-1997, based 030/ATL, Line Ck., with 36 years. I remember Tom. My condolences. I was just a kid in the early 70's. Living in Coral Gables, fatherless, my Mom signs me up with Big Brothers. I was matched with one of Tom's roommates, a Delta engineer by the name of Bill Buntin. The search for Bill led me here. 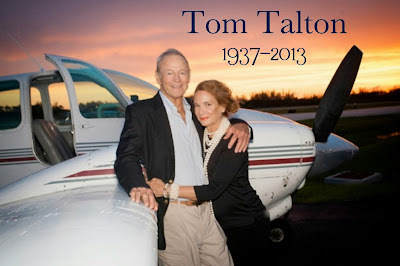 Tom was a great guy. I remember driving the "gang" home from Coconut Grove one night in his new Lincoln. I was 15. It was cool :) . The sailing, diving, motorcycles, flying. I'm sorry to see of his passing. I've had a time share on Vanderbilt Beach in Naples for 20 yrs. If I'd only known.....I'm still looking for Bill. Martha, I'll call you.